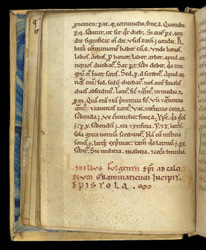 This mid to late 12th century manuscript belonged to St Augustine's abbey, Canterbury. It contains an assortment of writings which might have been of interest to a theological writer working in an important monastery such as St Augustine's. Detailed expositions on grammar and the meanings of obscure words found in scripture, recipes for gold and colours for illuminating, a homily for Palm Sunday and a letter of spiritual counsel to a monk are included. It probably would have been used as a reference for writing theological commentaries and sermons and in producing materials for paintings in manuscripts. The last page of the collection of notes called 'Book of the Philosophy of Solomon' is inscribed in its lower margin, "Little Book of Fulgentius the bishop to Calcidius the grammarian begins; the epistle."